Poole, located in Dorset on the south coast of England is a beautiful coastal town and seaport. Blessed with the world's second largest natural harbour and magnificent beaches, Poole is nicknamed as the "St. Tropez of the South Coast". Poole town centre is concentrated around the old quay with many cosy restaurants and bars serving local fish and other seafood within the area overlooking the harbour. Poole makes an ideal summer destination with beautiful clean beaches at Sandbanks, one of the top 10 beaches in Europe to hold the Blue Flag since 1980s. Whatever the weather, Poole offers a number of other attractions which include "Cockle trail", a walk back into the history following brass plaques, the Waterfront museum, Poole Pottery factory and outlet which has been operating in Poole for over 100 years as well as the unmissable Brownsea Island which is one of the National Trust properties and is maintained as a traffic free island apart from people being ferried to and from the island from Poole harbour. The island is treasured for its rich wild life and peaceful walks. And if you are prepared to go a little further from Poole, you can drive through the fantastic Jurassic coast with exquisite sceneries and coves in Dorset, classed as a World Heritage site and also visit the Monkey World just 30 minutes drive away from Poole. Poole is also perfectly suited for adrenalin filling water sports such as windsurfing, kite boarding, sailing and kayaking or alternatively relax and picnic on the beaches. 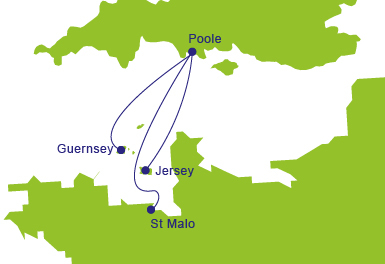 Poole Ferry port is easily accessible and offers connections to the Channel Islands of Jersey and Guernsey and to the ports of St. Malo and Cherbourg in France. Poole ferry terminal is a single storied building which provides all the basic facilities such as a cafe and snack bar, toilets, showers and baby changing facilities, disables facilities and assistance, a bureau de change, pay phones and left luggage facilities. There is a paid car parking facility opposite to the terminal building with overnight parking facilities as well. For further information please call 01202 440220. By Car, A35 and A350 link to Poole from other major highways such as A31, M27 and M3. Ferry is clearly signposted once in the town centre. By Train, Poole railway station is located just 20 minutes walk away from the ferry terminal and there are several connections via London Waterloo to Poole run by Southwest trains. By Coach, National Express offer services to Poole and the coach terminal is about 20 minutes walk away from the ferry terminal in the Dolphin Centre.